You didn’t think BMW would forget, did you? Having put fully redone “mainline” 5-Series premium-midsized sedans in showrooms for 2017, its next task was to flesh out the line for ’18. Along came a hybrid, a diesel, a twin-turbocharged V8, and—yes, an M. Of course an M.
The new 2018 model kicks off the sixth generation of the BMW M5. 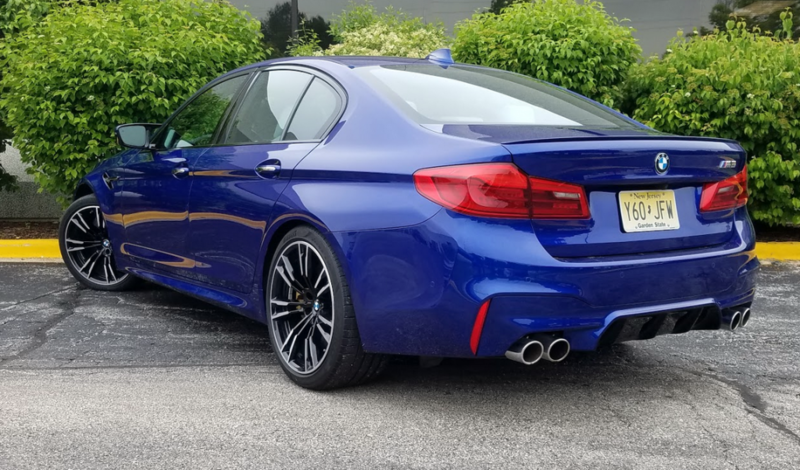 Previous M5s were all rear-wheel drive only, but the 2018 M5 comes standard with all-wheel drive. 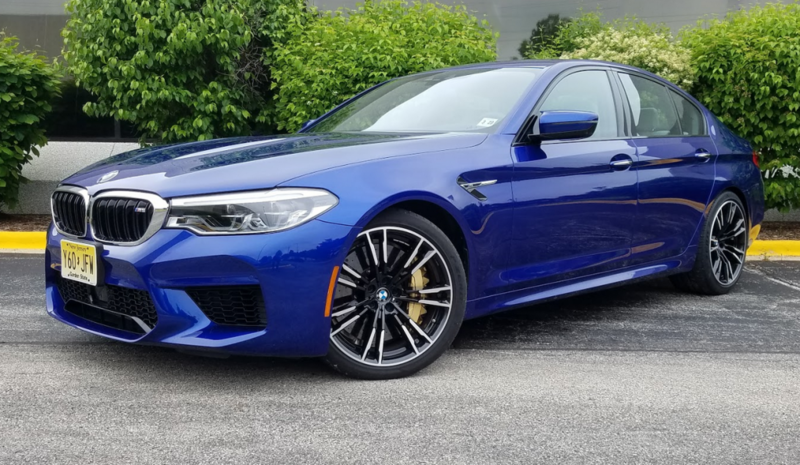 The latest in the long and mostly impressive line of high-performance M5 sport sedans rolls out with a gob more horsepower, a specific version of xDrive all-wheel drive, launch control, and a lightened platform. 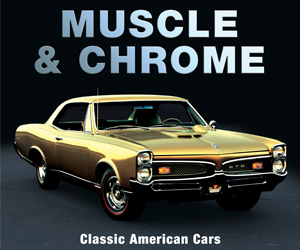 It gathers into a fast-moving confluence of gracious luxury, of-the-moment technology, and hot-rod muscle. It can all be yours for $104,595 if you add nothing to it but the requisite $995 delivery charge and an even grand in Gas Guzzler tax. The M5’s cool, sophisticated cabin is rife with impeccably executed details, such as multicolored stitching on the leather-wrapped steering wheel in BMW’s signature light-blue/blue/red M colors, and M5 logos (that light up at night!) inset into the front-seat headrests. The front seats offer an excellent mix of comfort and support in fast corners. The 2018 M5 is quite a bit different than its predecessors. It is the first sedan-based M vehicle with all-wheel drive. In this application, the system has a pronounced rear-wheel bias and can even be set for pure rear-drive operation at the driver’s discretion. Despite the added weight of the xDrive componentry, the new car is actually lighter than the last M5. A roof panel laced with carbon fiber is part of the diet plan. Also, that icon of performance-car driving, a manual transmission, is nowhere to be found. An 8-speed M Steptronic torque-converter automatic handles the chores, but like the all-wheel drive its performance characteristics can be adjusted to meet the driver’s needs. Our test vehicle was equipped with the optional 20-inch M wheels ($1200) and M carbon-ceramic brakes ($8500). It would stretch credulity to suggest that the kind of urban commuting routinely done by Consumer Guide® editors could plumb the M5’s at-the-limit capabilities. However, it’s still possible to experience impressive things about the car. After all, there are expressways (sometimes not so crowded) and side roads of varying condition. As before, the M5’s engine is a 4.4-liter dual-overhead-camshaft V8 with twin turbochargers. For 2018, though, the turbos deliver more boost, which helps account for a 40-horsepower hike to an even 600. Torque rises to a maximum 553 lb-ft in effect from a low 1800 rpm up to 5700 revs. Tromp the gas from a standstill, not even necessarily all the way to the floor, and you’ll experience genuine “shoved-back-in-the-seat” acceleration. The manufacturer claims the M5 will charge from 0 to 60 mph in 3.2 seconds—and some of the enthusiast media thinks BMW is being modest. The car certainly feels that strong. A console button lets the driver change throttle response from marginally tamed “Efficient” up through “Sport” and “Sport +” settings. In addition, the transmission’s “Drivelogic” adjusts shift characteristics three ways at the tap of a button atop the shifter. In free-running highway driving with the most-aggressive mode activated it’s an eye-opener to put some weight on the pedal. What follows is an immediate three-gear kickdown to fourth and a hasty escape to a point further down the Interstate as the transmission holds this gear for a while—all with an operatic soundtrack playing in the background. (Soundtrack might be the right word for it considering utterances from the sport exhaust are fed into the cabin through the audio system.) Transmission action is smoothly unobtrusive in the base and middle settings, and drivers who want to exercise hands-on management can flick though the gears via steering-wheel-mounted paddle shifters that respond instantly. Top speed is capped at 155 mph but the $2500 M Driver’s Package option includes a 189-mph limiter. The EPA fuel-economy estimates for the M5 are 15 mpg in city driving, 21 on the highway, and 17 combined. Based on this driver’s experience, a stint of 203.8 miles with 47 percent city-type operation, that’s about as credible as the acceleration times—he averaged 15.9 mpg. Note that the car comes with an automatic stop/start feature. Nice try, BMW. . . . 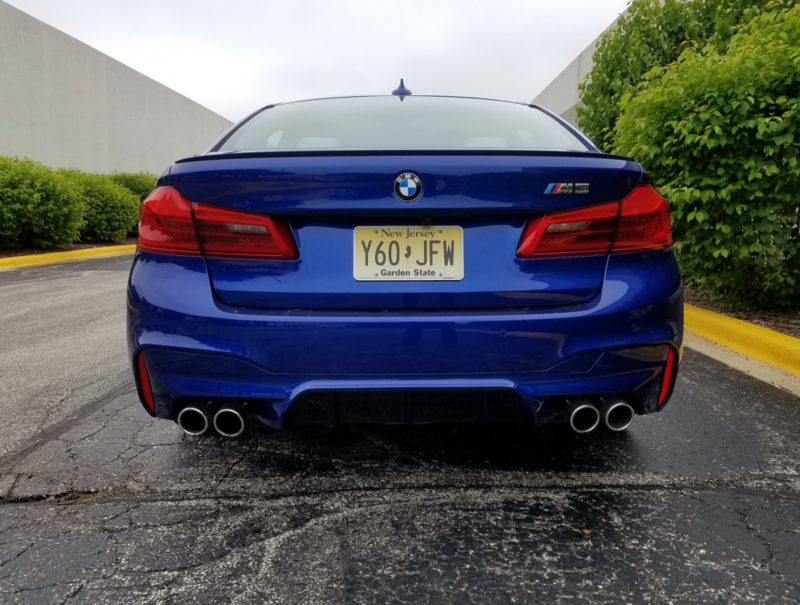 The M5’s unique front and rear fasciae are fairly subdued for a 600-hp super sedan, but the polished quad exhaust outlets are tip-offs. There are M-branded parts and systems throughout the car, particularly in the chassis, including an adaptive M suspension with electronically controlled dampers. This, too, is filtered through a three-stage mode control, with “Comfort” replacing Efficiency in this case. From behind the wheel, the Comfort-mode ride felt firm but still admirably supple enough. However, a couple of rear-seat passengers complained of being noisily jostled over bumps. 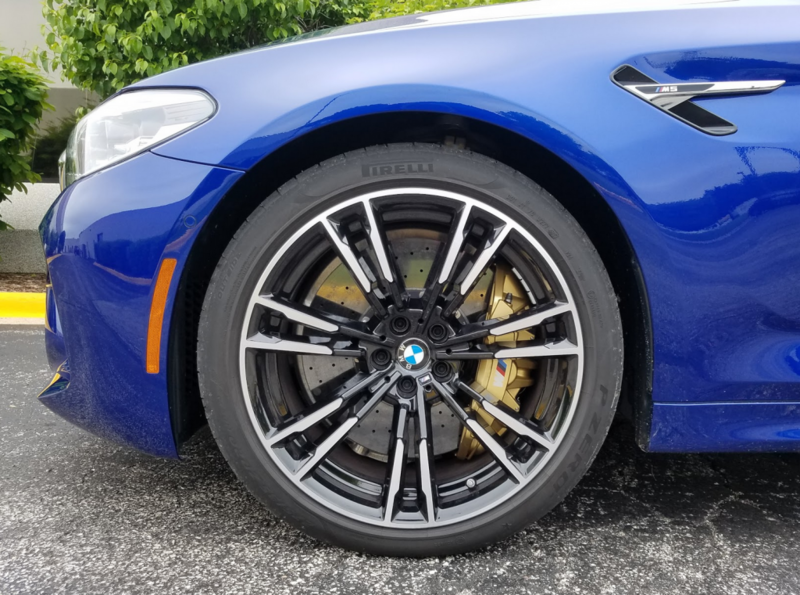 (The test car did have optional 20-inch wheels in place of the standard 19-inch staggered-width rims that might have delivered a bit more compliance.) Punching up to Sport + makes the M5 downright stiff with a nervous feeling on anything more “textured” than racetrack pavement—say, Chicago streets. Body roll is exceptionally well controlled, and steering is quite responsive even in Comfort. It needs to be, because the M5 feels every bit the midsize car that it is. Brakes are excellent. The test car was outfitted with M carbon-ceramic discs. They scrub some weight out of both the car and the buyer’s wallet. At $8500, they were the priciest option on CG’s Marina Bay Blue Metallic tester. There are some things to knock. This being a BMW, it has iDrive 6.0 to govern navigation, audio, and other infotainment features from a central controller on the console. It’s tough to figure out and requires a lot of attention-diverting operation—so typical of big-ticket European cars these days. Also, the shift lever takes some adapting to. For one thing, the Park setting is made by a small button near the stem instead of near the top of the lever, where it would be easier to reach with a thumb. Then, too, it can take some serious money to make an already-expensive car live up to its highborn image. 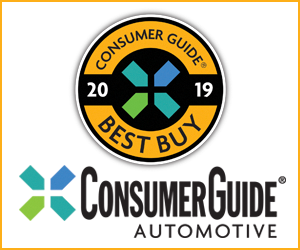 Things like heated and ventilated seats, wireless charging, Wi-Fi hotspot, a rearview camera, and Apple CarPlay compatibility all contributed to raising the total price of the test car to $129,795. As in other 5-Series models, the trunk is somewhat oddly configured, and when the rear seats are folded down, they rest slightly above the level of the trunk floor. There is decent passenger room for four adults. Anybody who doesn’t agree can at least take solace in knowing that in an M5 the drive might not last long. The 2018 BMW M5 provides tractable, supercar-level performance combined with the coddling luxury and practicality expected of a luxury-brand midsize sedan–but you’ll have to pay supercar money to get one. Written by: The Daily Drive staff on August 2, 2018.